Offer your students a field trip they will never forget as they go back in time 100 years to experience school in a one room schoolhouse. Your students will be immersed in a day full of hands-on activities that will teach them more about life at the turn of the century than any textbook you use. Use of the building is inexpensive. The committee charges $45 for the day’s use. 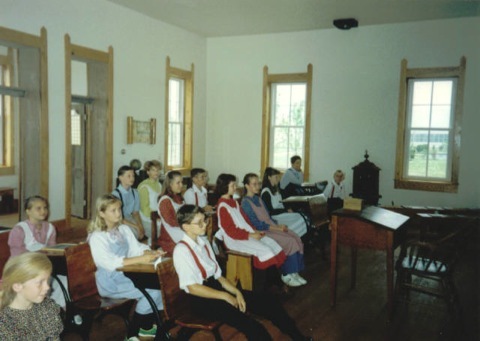 The Schoolhouse Committee has put together a manual for use by teachers who wish to serve as their own schoolmaster or marm for the visit, or a schoolmarm may be hired for an additional $50. A teacher serving as his/her own instructor is welcome to bring up to 50 people at one time. If you use our schoolmarm, we ask that you limit your class size to no more than 30. Visits may be scheduled any weekday during the months of September—May, except during scheduled vacations or half-days for the students of the Flatrock-Hawcreek School Corporation. The success of the field trip will depend on your enthusiasm and your preparation for the field trip. Students are asked to come in turn of the century costumes, carrying lunches that have been prepared at home using items and wrappings that would have been available a century ago. Students and parents share this experience as they prepare for the day. Students go home to relate their experiences and what they have learned. Follow the appropriate Links below to insure a wonderful visit.